CeFaan Kim has more on conditions from Sea Bright. 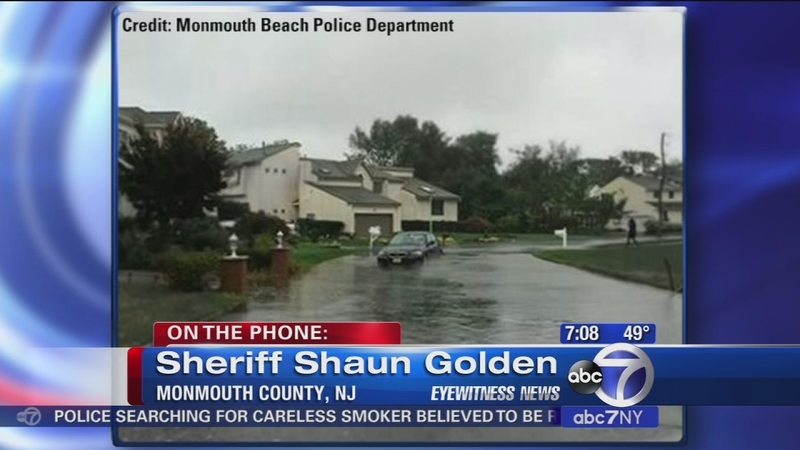 SEA BRIGHT (WABC) -- A drenching rain continued to soak most of New Jersey on Saturday, spurring minor flooding in some areas and washing a Jersey shore home into the water. The storm had also caused scattered power outages throughout the state, with about 3,600 utility customers having no service as of early Saturday afternoon. The rains had also slowed down traffic on the state's major roadways, including the Garden State Parkway and the New Jersey Turnpike, but no major travel issues were being reported. The wet weather is expected to continue through the end of the weekend, and a coastal flood warning for the state was due to remain in effect until Sunday evening. About two inches of rain had fallen in most areas since Wednesday, and forecasters said another 1 to 2 inches was possible by Sunday night. The weather system comes on the heels of what was thought could be a devastating hit by Hurricane Joaquin, which was projected to head directly toward the region in the initial models earlier in the week. Joaquin now appears be heading back out to sea as it moves northward. Coastal communities were bearing the brunt of the storm, as the heavy rains and high tides battered the region. No fatalities were being blamed on the storms, but they did dislodge an entire house from its pilings in a low-lying area of Middle Township in southern Jersey. The remnants of the home could be seen in Grassy Sound after daybreak Saturday, and residents there were bracing for the possibility of moderate flooding Saturday afternoon. No one was in the residence when it dislodged, and authorities said the matter remains under investigation. Joe Clifford, who lives in the neighborhood, told The Associated Press that the house broke loose and went by his home, then hit and a few decks out in the water and struck his 18-foot boat - which capsized - before it went out to the bay. "(The house) is just sitting down in the bay now, it's in pieces," Clifford said. While Superstorm Sandy destroyed decks and caused other damage in the area when it hit three years ago, Clifford said he had "never seen anything" like the storm that hit Friday night. "The winds were incredible, and everyone didn't get their boats out in time," he said. "There was lots of destruction from winds. We knew there was going to be a storm, but we didn't know it would be this severe." Clifford said he and his neighbors were working together "to make sure we don't lose anything else" while they remained on alert Saturday afternoon, waiting to see what the storm would bring next. Rain will lighten up on Saturday with the main concern being additional coastal flooding. Residents in Seaside Heights know painfully well the potential havoc from a coastal storm. In preparation, officials cleaned out storm drains in the streets, they asked residents to move all cars from flood prone areas, and they have on standby a convoy of army vehicles and Humvees that can drive through four feet of water. They are not anticipating the need for evacuations this weekend. They do have shelters on stand-by in Toms River and if the governor calls for evacuations, the mayor says it will be mandatory. They're not going to risk the lives of rescue workers. And in Long Beach, N.J., the police department said there's beach erosion and moderate to major flooding, making much of Long Beach Boulevard south of 25th Street in Ship Bottom to North Beach Haven impassable. Have photos of the weather? Send them to us via Twitter or Instagram using the hashtag #abc7NY.